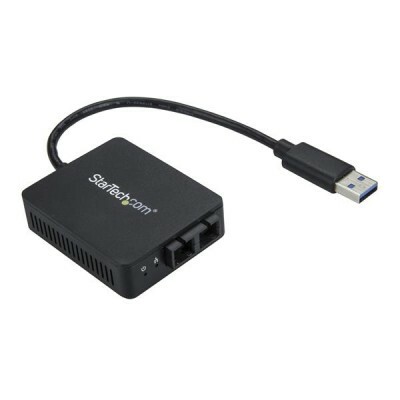 This USB to fiber-optic converter lets you utilize the USB 3.0 (Type-A) port on your laptop or tablet to provide a secure fiber network connection. WindowsÂ® and Mac compatible, the network adapter provides a 1000Mbps Ethernet network connection and 1000Base-SX SC optical transceiver. The USB to fiber-optic converter is equipped with an optical transceiver for 1000Base-SX networks, providing network connectivity with a maximum range of 550 m over multimode fiber. This USB to fiber converter provides reliable connectivity while protecting your network from problems with electronic interference - a common issue with RJ45 networks. Fiber-to-the-desk connectivity (FTTD) maximizes network security, reducing the risk of data leaks for sensitive information, without compromising network speed and reliability. Compact and portable, this USB 3.0 fiber-optic converter is powered directly from the USB port, making it easy to connect when youâ€™re on the go. Get up and running quickly. The converter supports certified drivers for Windows, Mac and LinuxÂ®. When you plug the adapter into a USB port, you simply install the drivers and the adapter is ready to transmit over a fiber network. The US1GA30SXSC is backed by a StarTech.com 2-year warranty and free lifetime technical support.